As (Nutritionally) Well-Rounded as the Buddha's Belly! What’s a healthy way of getting a balanced meal rich in protein, vegetables, grains, and good fat? Buddha Bowls! We love whipping up these colorful bowls for lunch and weeknight dinner. 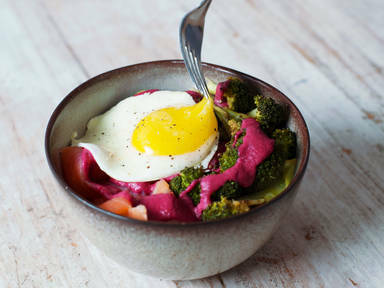 Here, we have nutty black rice with spicy broccoli, creamy avocado, and a soft fried egg—topped with a dressing made from all the good stuff; beet root, tahini, and lemon juice come together as a creamy, pop of color to finish off this wholesome dish. Check out the video for the full recipe!